We know you love jailbreak. Pangu has already released an iOS 9.3.3 Jailbreak for iPhone and iPad devices. It is available to download but here is the catch. Jailbreak tool does not ensure that you can get everything you were getting back in the jailbreak days. Chinese developers are developing new jailbreak tools, and there is some friction between Cydia creator, Saurik, and Chinese developers. Cydia itself requires an update on the launch of new jailbreak tool. Also, this is something that is not being discussed everywhere. Saurik, the man behind Cydia, has finally pushed the major update to Cydia. The update ensures Cydia works correctly on iOS 9.3.3 jailbreak devices. It allows users to get their wanted Cydia tweaks on iPhone and iPad devices. We are talking about the Cydia Substrate update, which went available to all jailbroken users on iOS 9.3.3. You need to update your Cydia to the latest version to get all features working for you on iOS 9.3.3 jailbreak. Cydia Substrate update is an essential update that you could not skip or miss on your iOS 9.3.3 jailbreak running device. 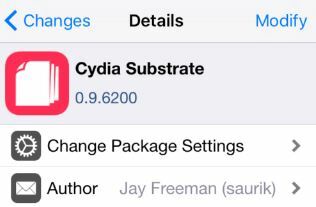 Many of you may not have heard about it, but Cydia Substrate is the most important piece of the puzzle in Cydia and Cydia Tweaks. It offers the platform for different Cydia Tweaks and allows them to operate on your iOS devices. If you are running outdated Cydia Substrate version, it means you must be skipping some important features or your device is about to crash. Cydia Substrate provides the essential support for tweaks, themes, and apps that are available on Cydia. It also fixes general Cydia issues that cause trouble for iOS jailbreak users. In the latest, Cydia Substrate, Saurik has fixed the annoying Storage Space bug for iOS devices. You do not have to worry about the random errors coming at you. There are some noticeable changes available in latest Cydia Substrate version. It allows you an option to select manually the storage to store / install any tweak on your device. Furthermore, it offers the “No Substrate Mode” – a big help for iOS users who love to test new Cydia tweaks on their devices. No Substrate Mode allows you to boot your device without loading any tweak on your device. It is a helpful feature that you can use when you accidentally install some faulty jailbreak tweak. There was a time when No Substrate Mode was the most wanted feature for Cydia users. You can entitle it as a debug mode for your jailbreak device. It helps you when you crash your device and provides a way to uninstall the faulty tweak without restoring or again jailbreaking your device. In the past, we used to suggest people that they have to re-jailbreak their device if they were stuck with some faulty tweak, but that is not going to happen in the future. You can easily disable Cydia tweaks by pressing Volume Up button during the boot of your device, and it will allow you to access your device even with a faulty jailbreak tweak installed. You can get latest Cydia Substrate update for your iOS 9.3.3 Jailbreak running the device through Cydia. It must be already available to you. All you need to do is run Cydia and look for updates. It will automatically ask you to update Cydia Substrate on your device. It will make Cydia compatible with your iOS 9.3.3 jailbreak device.